A weather app on the iPad? Why not just look out the window is the usual response. Soon followed by, do you know if it will rain tomorrow, I have a thing I have to do outside. 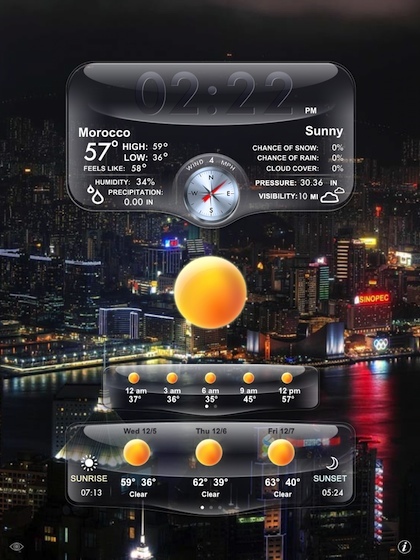 Thus, apps like Weather Genie have become popular as a full feature, yet quick access, iPad reference tool. 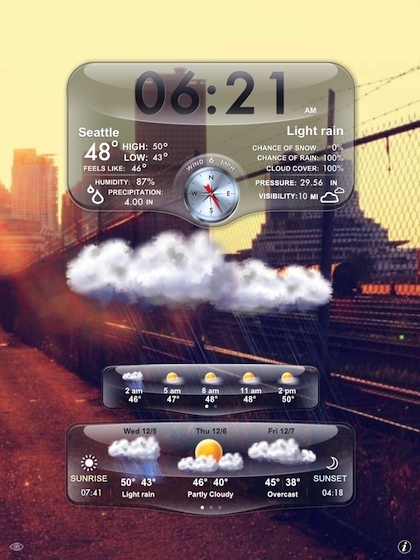 There have long been apps with extensive information about all things weather. And of course, there are the simplistic apps that pop up the temperatures for an area in a easy to read way. Weather Genie seems to have found a nice ground between. There is a lot of information, but it is presented in a fashion that makes it a quick reference tool rather than something having to be studied. 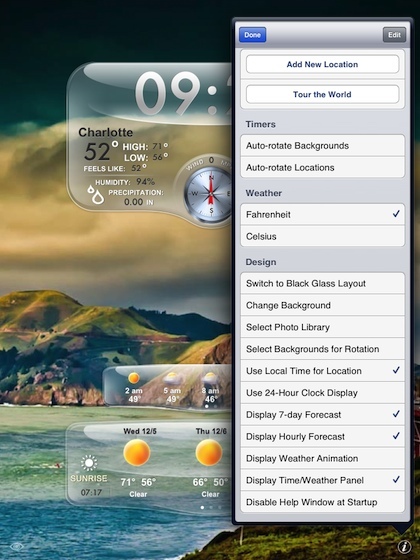 Choose a home city and background image to use Weather Genie as a nice looking weather tool. Swipe across the screen to change the city or background (25 to choose from), or use the Automatic feature to tour the world via 100 cities. How much or how little information, as well how much the screen changes are all available to tune via the Weather Genie settings area. Weather Genie settings access is via a button on the lower right of the screen and hiding the weather information so you just see the HD background photos is via a button on the lower left corner. Notice the image on the middle of the page matches the current time of day and weather. You can have clouds moving around, rain, mist, sun rising and more. If your in a meeting room with no windows, the Weather Genie weather image tells you at a glance if you need to allow extra time in traffic because it’s raining or maybe you should wrap up early because it’s sunny and you really need to enjoy some sun! Being a Universal app, buy one copy and enjoy on both your iPad and iPhone.